(Scott Bowling) playing in all three. Amelia Engelmann (lower left) proved a surprise convert when the 13-year old played her first game of Dip ever and loved it despite being tossed in with the sharks. Those Engelmann girls are tough! 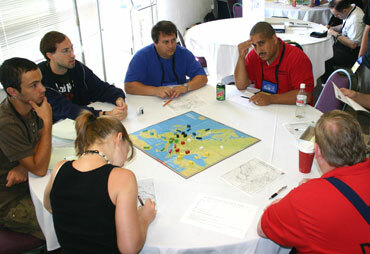 After a one-year absence from WBC because of a conflict with the World Diplomacy Championship in Washington (and a conflict caused by players planning vacations in Washington and Baltimore around the event, which in part led to it not being held in Lancaster), and a longer absence from the main convention, Diplomacy made its return to WBC in 2006.High hopes were expected for the game's return, but things did not start out well when only 14 players appeared for the first round on Wednesday morning. Perhaps a Wednesday, Friday, Saturday schedule was not in the players' best interests, but as the GM was in the B-17 tournament all day on Thursday, there wasn't much choice. Still, two solid games were played, capped off by former champion Nick Benedict as England breaking out of a three-way battle with RobVollman as Austria and Angela Farrington as Germany to score a solo win.Wednesday's poor showing was written off with, "Well, not many people are here on Wednesday." Unfortunately, I still can't find an excuse for only seven players showing up on Friday. (In a way, it was a good thing that there was only one table that day, as none of the players brought a copy of the game - in fact, nobody brought a copy of the Hasbro version during the entire event - but the GM did have one on hand for just such an emergency.) 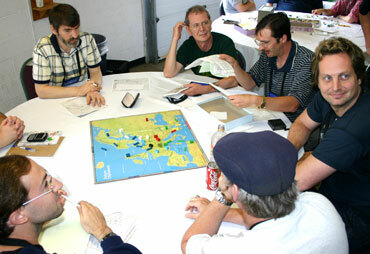 Round 2's one game ended with Dennis Mishler leading a five-way time-limit draw with 13 supply centers as England. There was a marked improvement on Saturday, as 14 people appeared for the finale. (Well, 15, but one was turned away for having a "Friday" badge. Yes, some of us do badge checks.) Both of the boards played on Saturday were led by strong England players (in fact, four of the five games were led by England, which is strange as Diplomacy is usually more balanced than that), with Olin Hentz's 13 supply centers leading a four-way finish in one game while Robert Vollman got to10 as all seven players were still hanging on at the time limit in the other. When all was said and done, Nick Benedict's game win was far more than enough to give him the event win, his second in the tournament's history. Dennis Mishler's 13 as England on Friday, along with 9 as Italy to Olin Hentz's 13, got him into second, while Scott Bowling's 12 as Turkey on Wednesday and 6 as France on Friday, placed him third. Scott's Wednesday performance also won him the Best Turkey award, and unlike some tournaments where they change the name to "Best Sultan of Turkey" or "Outstanding Play of Turkey," I call it "Best Turkey", and tell the winner that if anybody has a problem, he can say that it was for a deli sandwich competition - he had the best turkey, but finished third in roast beef, and the less said about his meatball sub, the better.